! Tip Remember, there are NO software updates to install to use Internet MMIR. By logging on, you always have the latest version! Maintaining your MMIR account is quick and easy. About the only thing most users have to do is keep their Address Book current. Sometimes, you will need to add or remove aircraft from your inventory, change a registration number, alter your password or e-mail address, or add or remove additional users. On the Main Menu, this section is used to keep your account up-to-date. Click on the appropriate link whenever you nned to change something. This will take you directly to your Address Book. From there, you can add, delete, or amend entries. See Chapter XIV. Since you are using MMIR, you obviously have a fleet of airplanes that you regularly service. These don't have to be "your" aircraft, but any aircraft that you perform maintenance or repair work on. Having the basic information on each aircraft already in MMIR, such as registration number, serial number, and make and model, saves you time and typing errors when completing a MMIR report. Enter your aircraft data one time, check it carefully, and it will be ready for you to select from a pull-down menu, without having to re-key all the same information. Of course, your fleet changes, or mistakes happen. By selecting the Fleet link, it is easy to keep information on your aircraft fleet current. Amending your fleet information is subdivided into 2 categories: 1) editing or deleting aircraft from your existing inventory, and 2) adding a new listing. The Edit selection will take you to another page, with all information for that aircraft listed. You then have to opportunity to change whatever it is that needs fixing. 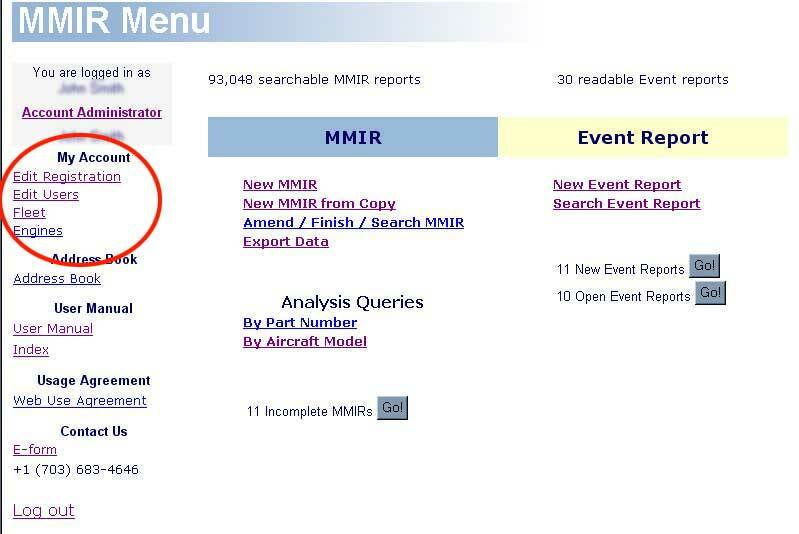 To remove the aircraft from your MMIR listings, select "Delete this aircraft." A flag will appear verifying that you want to remove the aircraft from your listings. Click Yes to erase that aircraft. NOTE: MMIR saves each report as a permanent stand-alone file; i.e., information in a report does not change based on your account information. For example, over the years, you might enter dozens of reports on aircraft Nxxxx. If you eventually delete Nxxxx from your MMIR account, all those reports for that aircraft remain intact. The "Add New Aircraft" section allows you to enter the basic information for the new aircraft. Once you press the Add button, that aircraft listing will be available from the MMIR form pull-down menu. To power your fleet of aircraft are your engines. The same concept described for your Fleet applies here. Once you enter the information on your engines into your MMIR account, it is available via a pull-down menu on the MMIR form. You can add, delete, or amend entries to your engine listings. Amending your engine information is subdivided into 2 categories: 1) editing or deleting an engine from your existing inventory, and 2) adding a new listing. NOTE: MMIR saves each report as a permanent stand-alone file; i.e., information in a report does not change based on your account information. For example, over the years, you might enter dozens of reports on a certain engine. If you eventually delete that engine from your MMIR account, all those reports for that engine remain intact. Click this link to change your registration information, including e-mail address, password, company name, and so on. You will notice that the Amend Your Information screen is identical to the form that you used to initially register, only now your registration information is "pre-populated" on the form. Just change whatever it is you need to change.
! Tip Many people "forget" their password after they change it. You can always use the "Forgot your password?" link on the sign-in page if you need to, but it is generally more convenient and less surprising just to remember that you changed your password. At the bottom of the Amend Your Information screen, you can turn Auto-notification on or off, or edit additional users. The Account Administrator uses this link to add, change, or remove additional users, and assign Event Report User Levels and enable/disable Anonymous Event Reporting.